This is an (approximately accurate) excerpt of an actual conversation between me and my personal-chauffeur-for-life XFE at a gas station on Saturday morning, around 8 am. XFE (getting into the car after pumping the gas): Are you trying to kill me? Me (peering intently into my smart phone): No, why? 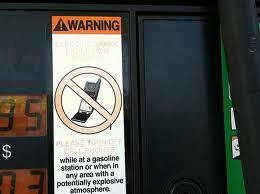 XFE: You’re not supposed to be on your phone while someone’s pumping gas. It’s dangerous. Me: What? I’ve never heard of such a thing! You’re lying! That cannot be true. XFE (pointing to a sign outside my window): There are signs everywhere. You’re not supposed to be on your phone. Me: You’re kidding! I’ve never seen that sign before in my life. When did that start? XFE: Always. It’s always been the case. You’re clearly trying to kill me. XFE: That’s it. I’m calling in the sharks when we get to Australia. "Sure thing XFE, we're on it!" And that, ladies and gentlemen of the jury, is conclusive evidence of spousal-equivalent foul play if I’ve ever heard it. You heard it. He said it. He’s calling in the sharks. There are just so, so many shark images on the internet. Just type in "shark on phone" and you get stuff like this. 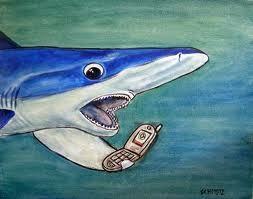 I just laughed out loud at the shark phone. Where does that exist?? I want to try it. I bet it works better than my blackberry. I don’t know, but I’ll try very hard to find out. 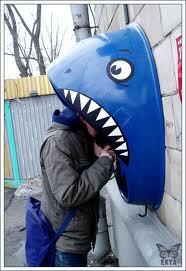 Tell XFE if the shark call doesn’t work he can always bear hug you under water and squeeze the air supply off. Just ask Gabe Watson how to do it. We’re OBSESSED with that story. Ob. Sessed. I was going to blog about it the other day but then thought maybe I shouldn’t joke about that stuff.